Are You an Empowered Person with Diabetes? I posed the question in the title of this blog post asking: are you an empowered person with diabetes? If you’re reading this blog post, then the answer is yes, you absolutely are an empowered person with diabetes! It is likely that you have access to a variety of tools, devices, the internet, community, and more, and while we didn’t choose to have diabetes, we all do have the power to CHOOSE what we focus on at any given moment, and HOW we use the tools that are available to us. Just because we have a chronic disease DOES NOT mean we must remain chronically ill prepared, and it also does not mean that we cannot choose to walk a path of healing for our minds, bodies, and souls. Every human being has strengths and weaknesses, and a wide range of skills that we use in everyday situations, but all too often people remain unaware of, or undervalue, their true abilities. When a person chooses to aim for empowerment, they are then able to take control of their life by making different choices and setting achievable goals. Now, the real question is, do you want to become an EVEN MORE empowered person with diabetes? My promise to you is that by the time you finish reading this, you will already feel more empowered, because you will be more aware of the wide variety of simple practices available to us all the time to cultivate the mindset and habits of empowerment, and your power to control your own actions – weather or not you engage in these practices regularly. I can also promise you that when you PRACTICE any of the exercises and activities listed below without any expectations other than to be present in the practice in the upcoming weeks, months, and years, your level of empowerment will undoubtedly grow stronger and stronger. This is an incredibly important and personal topic for me. Resources covering HOW to cultivate the habits and practices that allow us not only to build a strong, solid emotional foundation to build the rest of our lives on, but those same tools that we need to lean on when we are experiencing difficult times/burnout, are not offered at the doctor’s office. I know because that was my journey with diabetes for so many years. Clinical depression, eating disorder, obesity, shame, guilt, anger. That was my everyday experience and mindset for more than eight years, and it’s why I am so passionate about creating this resource that is free for everyone — because it’s a tool that I wish I had when I was struggling, and I want to continue helping to bridge the gap between traditional healthcare, and the emotional tools we all desperately need but are generally not given by our doctors. First of all, a huge thank you and congratulations for investing time into giving yourself the gift of an empowered mindset through easy to implement self-love and self-care practices. I honor your journey and your struggle. Together, we’re going to learn how to get and stay FEELING motivated and confident about our day to day decisions on our diabetes journeys! To go along with this post, I’ve created the this Diabetes Empowerment Handbook which is designed to give you a quick and easy reference point for this article (plus it includes links to even more resources mentioned below). You can download it (even print it) and keep it available to use as a reference guide and visual reminder you can choose to use ANYTIME you need to re-focus on living in the mindset of empowerment. Be sure to have a notebook handy as you read through, and take good notes on the ideas and practices that sound appealing to you. Using a notebook and writing out your intentions will absolutely make it easier to implement the different steps, systems, tools, and frameworks you will learn about, and also make it much more likely that you will TAKE ACTION! We’re here to help you understand HOW to cultivate the mindset of empowerment through easy to implement self-love and self-care PRACTICES in order to finally get the SUSTAINABLE results you need and deserve in your diabetes management practices and overall health and wellness. I agree with that definition almost entirely, other than the fact that I KNOW without a shadow of a doubt that empowerment is not just a noun, it is also a verb. The word empowerment alone is meaningless without being backed by ACTION, and that is what this handbook is all about. Throughout my life as a person with type 1 diabetes who has gone from clinically depressed with a binge eating addiction and weighing more than 200 pounds by the time I was 13, to a genuinely HAPPY, love and gratitude filled joyful person who fully embraces life in all aspects no matter what challenges may arise, and now having had the blessing of coaching thousands of people over the last 7 years towards those same goals, I can truly say that one of the biggest missing pieces that held me back, and holds most people back from creating the health they truly desire is not knowing how to differentiate words like “empowerment” and “mindfulness” from nouns to verbs. In other words, I knew what the words meant, but I didn’t know how to put them into the PERSPECTIVE of PRACTICE, or even that putting them into practice was not only important but crucial, and it wasn’t until I began choosing to PRACTICE living in the mindset of empowerment that I truly understood what it meant, what it FELT like in my mind, body, and soul. I hope this handbook will serve you on your journey to exploring and experimenting to find what practices of empowerment will bring you the most gratitude, love, joy, growth, and acceptance of what is. Your perspectives & priorities are choices, and your CHOICES are the only thing in this world and in your life that you can EVER control. Read that sentence over and over again, as many times as you need to until it begins to take hold in your mind, body, and soul. The biggest game-changer that allows me and my clients to FULLY & CONSISTENTLY embrace that all feelings and experiences of empowerment begin with self-love and self-care, is a true shift in PERSPECTIVE, which, for some, including myself, was/will be an epiphany. When we think of the things we need do each day to care for ourselves and create the healthiest, happiest minds and bodies we can so that we can show up each day for ourselves and those we love and care for, such as hydration, nutrition, physical movement, checking our blood sugar, taking our medications, etc., most people choose to see those things as a burden or a nuisance. The reality of the matter is that taking care of ourselves in those ways are things most of us are INCREDIBLY blessed to GET TO DO. If you have access to food, clean water, and medication, you are doing far better than more than half of the entire planet. Think about that for a while, and/or, think about that every day like I do, and let the feelings of gratitude for what you GET TO DO flood your mind and overwhelm the thoughts of what you perceive that you can’t do or have. Nobody is forcing you to eat, drink, or take your medications. YOU GET TO DO ALL OF THOSE THINGS, AND THAT IS AN INCREDIBLE, ALMOST INCONCEIVABLE BLESSING. If you happened to end up, even for a short time, without access to any of the things you may currently be perceiving as a burden, the life you are living now would seem like a dream come true. This shift in PERSPECTIVE is one that you must consciously and intentionally choose every day in order for you to finally understand that your health management must be your top PRIORITY. Your health must be your number one priority if you want to be the best version of yourself possible, be of service to those you love, and achieve any level of sustainable success in cultivating the mindset of empowerment. PRIORITIZING your self-love & self-care as #1 on your list is NOT a selfish act. 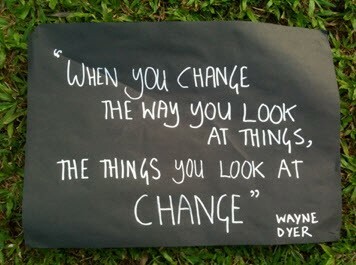 Shift this PERSPECTIVE and change your life! In fact, not choosing to take care of yourself and continuing to run on fumes while telling yourself that you need to take care of everyone else first is the most selfish act of all, because not only are you cheating and mistreating yourself, but those you love as well. Have you ever thought about why, when you take a flight on an airplane, they tell you in no uncertain terms that in case of emergency to ALWAYS put on your oxygen mask first before helping others? It’s because if you can’t breathe, you cannot help anyone else, and you are ultimately disempowered by choice. The exact same goes for taking care of your health, including but not limited to mindfulness, hydration, nutrition, and physical movement. If you’re always gasping for air, the help you attempt give to others will be nothing short of half-hearted at best. Sit down and perform a true self-assessment. 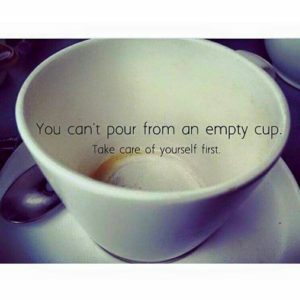 What is your PERSPCETIVE on your self-care practices right now? How full is your cup right now? Have you been telling yourself that eating healthy, hydrating yourself, checking your blood sugar, or taking your medications are annoying burdens? Have you been telling yourself you’re just fine because you’re used to (or even addicted to) being busy, and perpetually on the edge of exhaustion? Are your body and mind trying to get your attention? Are you listening or ignoring? Cultivate the habit of checking both your perspectives and how full your cup really is. Set a repeating weekly reminder to check in on how full or empty your cup is. How low have you allowed your reserves to get? – It is far better to recognize and remedy this NOW. Checking in with your perspectives & priorities is something that only you can do, and it is an incredible way to consistently PRACTICE the crucially important habit of self-love. The bottom line is this: NOW is always the BEST time to take action towards improving our mindset, and NOW is all we ever truly have since the past is something we can never get back to, and the future is something we cannot predict. ALL WE HAVE IS NOW. There will never be a more “perfect” time than NOW, and procrastination only takes us further and further away from the goals we have set for ourselves, from the gifts we have to give to this world, from our true selves, from feeling empowered. Perfection is an illusion, and the MOST WIDELY USED FORM OF SELF-SABOTAGE. Choose to stop using the word as an excuse that you are willing to accept in your life. Examining the words you use in your everyday life is a PRACTICE of empowerment and cultivating a healthy mindset. Banish it from your vocabulary. Catch yourself when you revert to using the illusion of perfection as the reason you choose not to move forward on something in your life that is important to you. There are many ways to put empowerment into action, and there is no one way that is best, or “right or wrong” way to do any of them. It is simply in the practice of doing them & being present where the magic happens. Below are a wide variety of practices and resources that you can choose from anytime to begin cultivating the mindset and habits of empowerment into your daily life. Almost everything listed below is free of charge, and are not listed in any particular order as they are all incredibly valuable ways to cultivate empowerment in your life. The only investment you must be willing to make is giving yourself the gift of prioritizing time for your mind to reflect and rest. This is generally much more difficult for most people to get through at first than an extremely rigorous physical workout. Please be mindful not to self-sabotage by choosing more than 1-2 new practices to focus on at once. Much like changing our physical health habits, changing our emotional health habits is a process that, if overwhelmed by too many new practices at once, is likely to be short-lived and unsustainable. Journaling: The act of journaling, getting all the stuff that is circling around in your head OUT onto paper, which I also call a “brain dump,” is by far one of the most effective practices of self-care regarding building the habit of empowerment that I’ve ever experienced, both with myself and countless clients over the years. You don’t need a fancy journal, although I do recommend getting yourself something that brings you joy to look at, however, a plain notebook works just as well! There is no wrong way to journal. No judgements, no expectations, just write. Meditation: I used to think I wouldn’t be able to meditate due to my all the thoughts swirling around in my mind, but boy am I happy to admit I was I wrong. Now that I’ve been meditating regularly for years and teaching others how to do so, I can say for sure that the number one barrier for most people when it comes to meditating is the belief that there is a right and wrong way to do so…a need to FEEL like we are doing it perfectly, which, as we learned, is an illusion. The other thing to keep in mind is that walking quietly in nature can be meditative, deep breathing is meditating, repeating a mantra is meditating. Experiment to find what meditation techniques work for you. Deep Breathing + Gratitude Stacking: It might seem like a no-brainer that it’s incredibly important that we breathe, but often we don’t realize how shallow we breathe on a regular basis, and the undeniable benefits of giving ourselves the gift of deep breathing each day. Please don’t discount the incredible power that lies in this practice. If you are willing to add listing in your mind all of the things you are grateful for while breathing deeply, something I call “Gratitude Stacking,” you will be blown away at how you feel during and after this practice. Five minutes a day WILL change your mindset if you do this without judgement or expectation, guaranteed. Yoga: As a certified personal trainer and someone who has gone from never exercising, to exercise being an integral part of my daily life that I crave and that keeps me mentally and emotionally empowered, I can say that there is no person alive that yoga doesn’t have the power to help in some way. There is no other form of exercise that I can say that about. Giving our minds and bodies the gift of gentle stretching, which is extremely necessary maintenance, is a highly effective form of practicing self-love, self-care, and ultimately, empowerment. Let go of the voices and judgements about you not being flexible enough, not having enough time to do it (15 minutes makes a HUGE difference), or any other thing that simply is not the truth. Just choose a video and be present throughout! Peer Support: Most of the practices listed here are solitary in nature, however, one of the most empowering practices that exists in this world is actively engaging with our peers with diabetes. Reading or Listening to Books: Building the habit of empowering thoughts on a regular basis is fueled by looking at or listening to words that motivate our internal inspiration to come alive. There is no longer the excuse of “not enjoying reading” with apps like Audible that allow you to listen to any book you want to read. If you want to fill your thoughts with empowering ideas, you must CHOOSE to do so! Grounding, Earthing, or BEING with the Earth: In short, Earthing or grounding is putting the body in direct and uninterrupted contact with the Earth. This means that skin needs to touch soil, sand, water, or a conductive surface that is in contact with the Earth. For me, this is most often standing or sitting in the grass (or if I happen to be near a beach, the sand) while practicing deep breathing at the same time, usually for 15 minutes or less, but when time allows, more. Personally, I don’t care how many scientific studies have been done to prove or disprove this technique because I KNOW, without a shadow of a doubt, that this makes a profound difference in my mental and emotional state IMMEDIATELY, every single time. You don’t need any fancy gadgets or tools to practice Earthing, just your body, your mind, and the Earth, and your willingness to let go of your negative thoughts, beliefs, and judgements. Volunteering + Helping Others: I could write an entire book on the life-changing power of helping others in any capacity, at any time, in any way. From a kind smile or word to someone who feels sad, holding the door for someone, purchasing a cup of coffee for the next person in line, to signing up at your local food bank, JDRF, SPCA, or ANY non-profit or organization of any kind that requires the selfless time of others to serve, THIS is the most empowering thing of all, and in my opinion, what life is truly about. No matter what is going on in your life, there is ALWAYS an opportunity to help other people, and actively, consciously and intentionally seeking out ways to do that regularly will PROFOUNDLY CHANGE YOUR LIFE FOR THE BETTER. As a Diabetes/Health/Life Coach, I always teach that the power of mentoring and coaching is often the most powerful differentiator to getting yourself to that next level, whatever that may be for you. Putting out free resources is something I’m EXTREMELY passionate about, as I want the information that everyone needs to move forward in their lives to be readily available. However, for most of us, free resources only take us so far, and what is required next is consistent and structured accountability. I have a strength coach for lifting even though I’m a certified personal trainer, because I know that he knows way more than I do about the topic, is more passionate about teaching that topic, and will show me tools and systems to get me to my goals faster and more efficiently. I have a business coach even though I am a successful entrepreneur, or rather, I should say, I am a successful entrepreneur BECAUSE I’ve had business coaches from day one. Hiring people, or, the perspective I use, investing in myself, in my personal growth and wellness so that I can serve at a higher level, is the single best investment I have made, can make, and will continue to make for the rest of my life. Doing so has allowed me to grow with so much less pain along the path of growth and change, because my mentors and coaches pointed out to me that certain roadblocks may occur, so I was prepared for them ahead of time and instead of tripping me up, we came up with a plan for how to navigate past them. Coaches and mentors have been invaluable on my journey to physical and emotional wellness, and living in the mindset of empowerment around my choices every day. If you are interested in exploring coaching for any aspect of your life and overall wellness, including but not limited to all aspects of diabetes management, physical + emotional health, spirituality, business growth, or relationship/intimacy coaching, please take moment to fill out the short questionnaire linked below and set up a time for us to have a phone call to explore the possibilities of working together! Thanks for reading, & congratulations for stepping up to take action towards creating the habits and mindset of empowerment in your life, and nurturing your emotional wellness! Leave a comment and share your experience! In the comments below, let me know what your favorite or most helpful parts of this article are, or any suggestions you would like to see added to future editions! Want to take your Diabetes Empowerment further, faster? I am honored and grateful to have hosted the online Diabetes Empowerment Summit in 2017. I interviewed and boiled down countless invaluable lessons from 25+ top experts and people with diabetes who have gone on to become successful doctors, coaches, bestselling authors, record-setting fitness competitors, yoga instructors, parents, bloggers, advocates, motivational speakers, founders of non-profits that do incredible work in our community, and so much more!